TCi Scholar Soumya Gupta, a Ph.D. candidate in applied economics and management at Cornell University, delivers an update on her fieldwork in the Chandrapur district of Maharashtra, India, where she is studying how women’s empowerment and participation in agriculture differs across farming systems and how participation in farm and non-farm employment may affect iron deficiency status. Read her previous posts here. This month, we organized a 10-day training session for our team of 20 enumerators and two supervisors. It was held at the Rural Health Training Center of the Mahatma Gandhi Institute of Medical Science (MGIMS) at Bhidi village, which is 35 kms from Sewagram (Wardha). The main focus of the training was to acquaint the team with the survey questionnaire and activities. We began with in-class discussions and mock interviews based on the paper questionnaire. Once the team seemed to have understood the questions, response options and skip codes, we moved on to training them in the use and handling of the Samsung tablets that were procured for the survey. 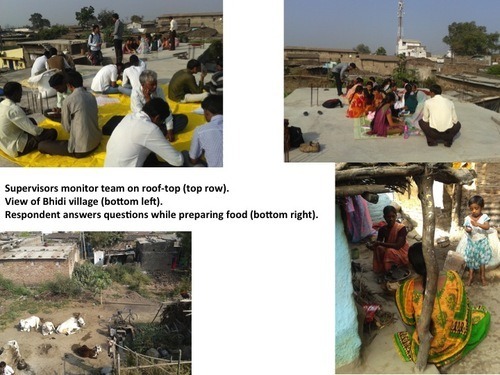 After that, practice interviews were held in the village. The team was also trained in taking anthropometric measurements for men, women and children. Portable stadiometers, infantometers and digital weighing scales were sourced from the Tata Institute of Social Sciences and Dr. Subodh Gupta from MGIMS conducted a day-long training with the team regarding the handling of equipment, placement of respondents, and recording of readings. In a parallel session, our phlebotomist was given a week’s training at MGIMS and the Metropolis laboratory in Chandrapur/Nagpur. It is one thing to discuss project details with your committee members/ project coordinator or other people who have been part of the process right from the beginning; it is a whole different ball game to talk about it to a group of people who have no idea about it and who are probably not very invested in it either. I was constantly wondering, am I making any sense to my team and have they really understood things the way I expect them to? The main focus was on understanding and interpreting the questions properly. The empowerment module developed by IFPRI took longer than the other sections. Within that, the section on relative autonomy in productive decisions was, for me, the toughest to explain. It was fairly subjective and therefore we had to go through several rounds of relevant examples and discussions before everyone was on the same page. For instance, how would you distinguish between ‘get into trouble’ vs. ‘disappoint someone’ in relation to ‘decision about purchase of agricultural inputs’? The good thing was that because our team didn’t understand it all in one go, we ourselves ended up understanding just how nuanced some of the questions and response options are. Everyone agreed that this is not like the other surveys they have been a part of – the questions are more involved and don’t have the standard yes/no or numerical response (10 acres/ 15 quintals/ Rs. 20,000 and so on). Another component of our training was field research ethics. For this, we used a field guide developed by the Johns Hopkins School of Public Health. A Hindi translation was provided to every participant. A part of that was an emphasis on the meaning of voluntary consent and why it is important. We distributed copies of our consent form to our team and every day there would be reading sessions. I realized that while the form itself seemed very obvious and clear to me, the team who were learning about the project perceived it very differently. Even the names of the collaborating institutes (TCi, MGIMS, TISS) were hard to say all in one go. Very often the three would be mixed up to form ‘Tata-Cornell hospital’! We were working with our software developer during the training period as well. The software was not well tested, so Kasim and the supervisors had to do so extensively prior to the training. Even then, our team identified several bugs during the training. We would then send the developer texts/emails in real time and he would respond, although not always in a timely fashion, and it quickly became frustrating. I started out being understanding and encouraging, but feel I eventually became very demanding and bossy. Little did I realize that I would have many more ‘Dear God, please give me the strength to deal with such-and-such person’ moments! One evening, we divided the team into groups of five and asked them to reflect on their experiences of the training. They talked about how they came from different parts of Vidarbha (we have members from Amravati, Chandrapur, Yavatmal, Buldhana and Wardha districts), got to know one another and learned how to use a tablet. They felt we didn’t incorporate enough ‘entertainment’ activities in the training schedule (haha!) and even wrote a poem about their time at Bhidi.